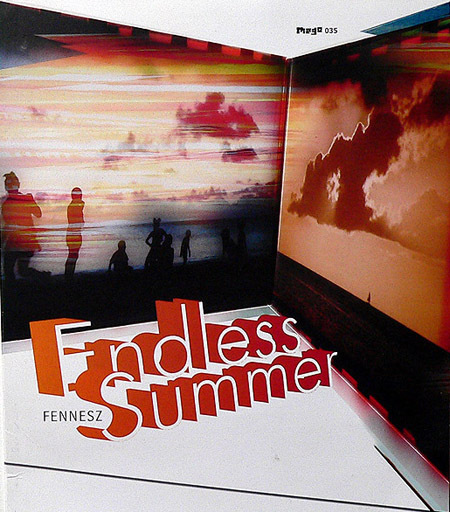 For those that are looking for something that’s melodic but with texture this Fennesz album Endless Summer is by far my favorite to put on when its just too humid in your home and all you wanna do just relax and not move. I would of posted my favorite track “Happy Audio” from this album but i think the repetition might of overwhelmed some people. The track Endless Summer feels like its split up in 3 parts where the guitar takes turns with this in and out melodic noise as the lead piece and at the end everything wraps together nicely. I think it would have to take 3 talented people like Christopher Willits, Biosphere and William Basinski to be able recreate a track like this again. The artwork by Tina Frank and photography by Hertha Hurnaus is just stunning and was ahead of its time i think for a 2001 release. I’d love to know if this wasn’t enjoyable for someone all the way thru especially towards the end where it sounds like Christian Fennesz brings in this muted string addition that brings everything together very tight in a good way in my opinion. For those who have this record its definitely worth dusting off and putting it on again. Com Truise.. Jacaszek + Swod .. Fennesz ..
Gawd i love Fennesz! I think Venice is my favorite, although endless summer has got some gems on it. Belong is another favorite group of mine, similar to fennesz but i think belong is more structured and melodic. Jakub i gotta say your contributions to this blog are making it a real treat. Man, Jakub – you’re posting alot. Hard to enjoy the music before a new post! I guess our languages are pretty simular (Norwegian right ? ), never knew that. I really adore the design/photography done for this Endless Summer piece. whoa, crazy ^. i have a 3″ by fennesz with a tasty track called “Tor”. pretty much everything he’s done is amazing. mego was an amazing label for it’s time, unfortunately i think their vision was too…digital mayhem-ish. Almost Tor, I’m in the Netherlands. When viewing the wonderful Riget series (by Lars von Trier) I learned that Danish is very simular to Dutch as well (and Swedish as well), but I didn’t know Norwegian was that close as well. I think that you could make yourself clear in Amsterdam speaking your own language Tor.